Nicole always thought she was regular-issue human...until she turns her husband's mistress into a mouse. The next day, Kailen, Fae-for-hire, shows up on her doorstep and drops this bomb: she's a Changeling, a Fae raised among mortals. Oh, and did he mention that her existence is illegal? 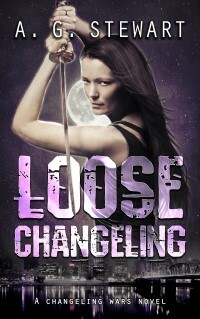 Loose Changeling is the first book in the Changeling Wars urban fantasy series. Read sample chapters, or check out reviews from readers like you. Nicole's only been appointed as a legal Changeling for one month when the complaints all over town about souring milk grow louder. This seems the harmless prank of idle sprites, but when Nicole’s sleuthing leads her to a mortal man locked in a trunk, marked for sacrifice, she catches a whiff of something more sinister. Changeling on the Job is a novella set in the Changeling Wars urban fantasy series. Nicole's life has finally wound down to normal--or, at least, as normal as life could be for a Changeling. Sure, her Fae hound roommate could be nicer, and she could use a part-time job to pay some bills, but she's closing the doorways between the worlds. She's got things under control. Until she's framed for the murder of a Fae King. Spare Changeling is the second book in the Changeling Wars urban fantasy series. Spare Changeling - Out! Loose Changeling - $0.99! How can you lose with this premise? Nicole always thought she was normal, until she catches her husband in bed with another woman, and in a fit of anger–turns the other woman into a mouse. And that’s only the beginning of Loose Changeling by A. G. Stewart. I held the frog a safe distance from my face. It stared back at me, its throat pulsing silently, its yellow eyes bright as marbles. Coffee and All Things Random reviewed Loose Changeling! love how quickly the action gets started, how soon all the troubles arise and come into place. I love the flow of the writing and the story, and how much Nicole's character developed and changed. I like the mysterious aspects and the danger and the thrill, and how you get so immersed in the story you find yourself rooting for Nicole and then realize you're trying to solve the mysteries as well. How many fantasy books would you have read that has a strong female character but is yet to understand the ways of Adult life. Not that I mind those amazing teenage characters (*cough* Hermoine *cough*), but now that I have a little (by little I mean, minuscule) experience of being an adult, I sometimes need a more mature point of view, even in fantasy genre.